Our first flight with Qatar Airways has been last year when we went to Bali for our honeymoon. We wanted to spoil ourselves and booked two Business Class tickets with the world best Business Class airline (according to Skytrax World Airline Awards). And what can I say? 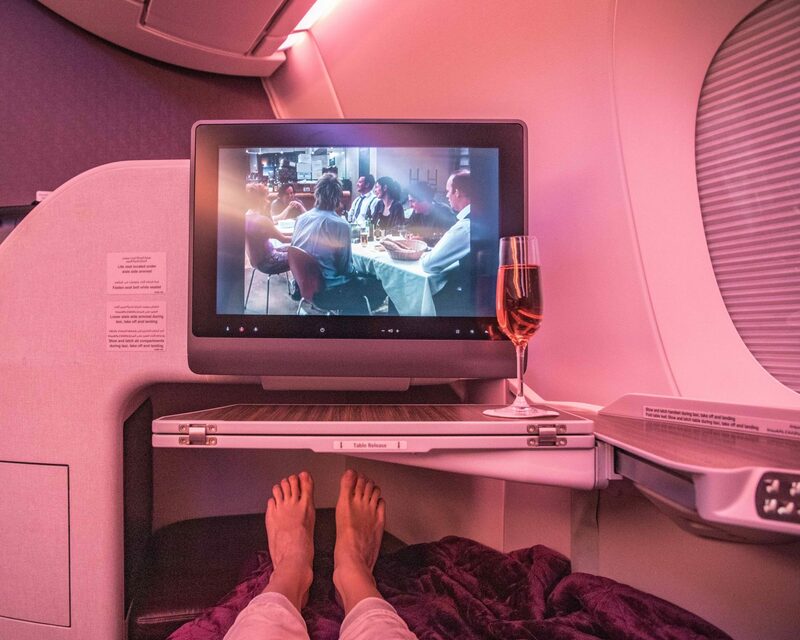 We loooooved flying with Qatar Airways and were mesmerized by the excellent service and Business Class amenities. So we were more than excited that we could travel again with Qatar Airways during our trip to Sri Lanka and the Maldives and to enjoy the fantastic service of this airline once more. 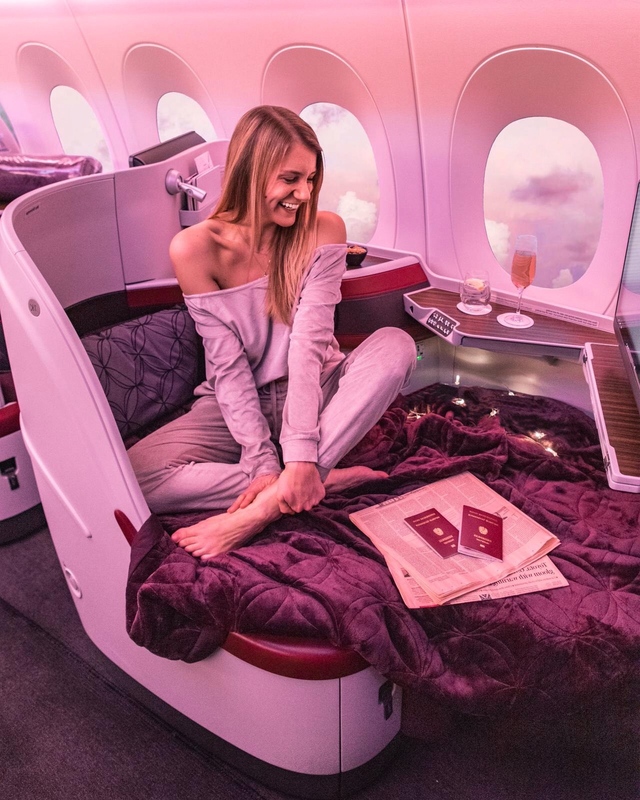 While you continue reading there is a high change you will head to the Qatar Airways website immediately and check the next available Business Class flights to your dream destination – because this is the ultimate way to travel! Baggage allowance: one of the many many advantages when flying Business Class with Qatar Airways is that you are allowed to check-in 40kg of baggage. So you can bring a lot of things with you or you can strain your shopping budget and buy a lot of souvenirs for your family and friends (or yourself 🙂 ). 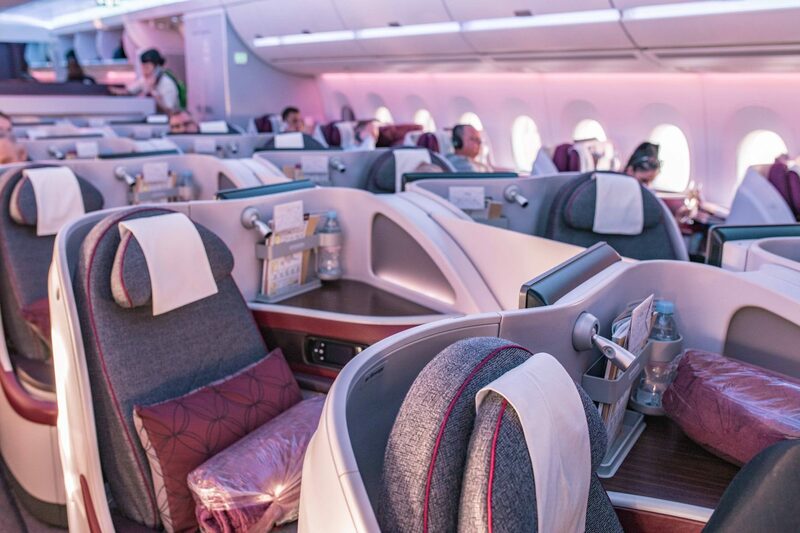 Airplane type: please note that all shown pictures were taken on an Airbus350, so the interior design and seating plan may vary among different airplane types of Qatar Airways. Your luxury travel experience starts right away with your Business Check-in at the Qatar gate. After a super-efficient check-in without any queue you can head right to the Qatar lounge and enjoy your remaining time at the airport there. You will be spoiled with some yummy food, snacks and drinks and when it’s time to board your plane you will be the first one to enter it. 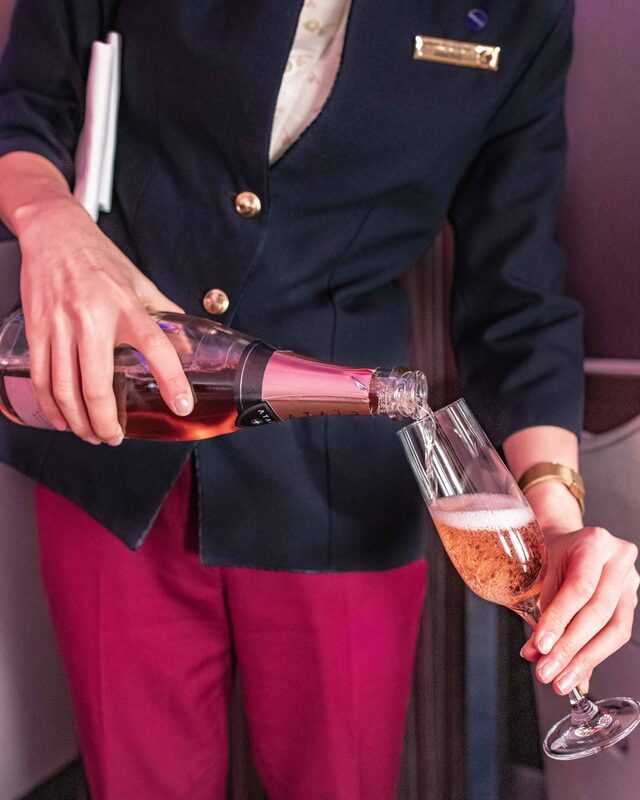 Your pampering and spoiling program continues the moment when you are boarding the plane: you will be welcomed by the Qatar Airways Business Class crew with a glass of champagne or any drink of your choice and you can choose between a hot or cold towel to refresh yourself. Do you know this feeling when you got a new toy or game as a kid and you wanted to explore every detail and how everything works? This is exactly the feeling you’re having when you are exploring your super luxury Business Class seat. Fluffy blanket & pillow: super cozy, keeps you warm when you are sleeping. 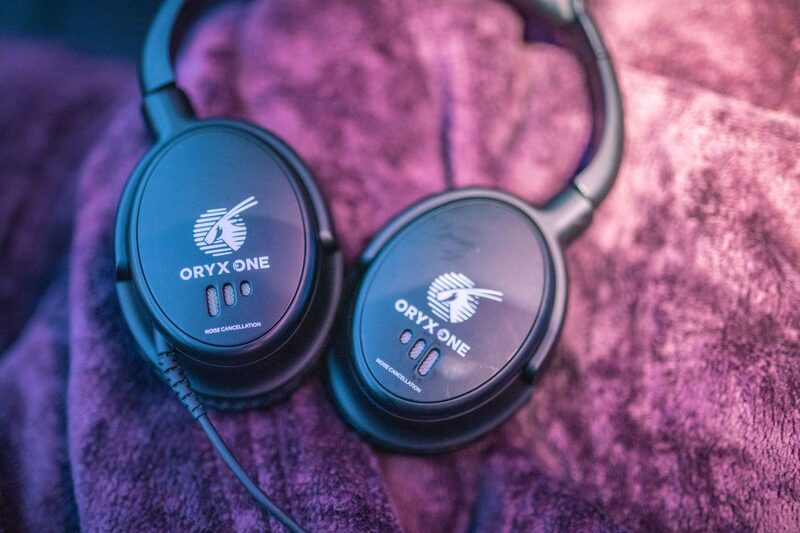 Noise cancelling earphones: if you ever tried some noise cancelling earphones you know that there is a huge difference compared to regular earphones. Beauty kit: you will find a little beauty kit with fluffy socks and a sleeping mask right next to your comfy seat. Rituals Cosmetics: you will find some Rituals Cosmetics beauty products in all the Business Class washrooms. So much space: besides the possibility to turn your seat into a fully horizontally bed you have much much more space compared to an Economy seat. You have a separate space right next to your seat where you can store your purse, books, phone etc. and you have several storage compartments where you can place your shoes etc. And: you don’t have to worry that your hand luggage will not fit into the overhead compartment because you have a whole compartment per seat, so there is enough space for lap top bags, duty free shopping bags or big sun hats (this would count for me 🙂 ). 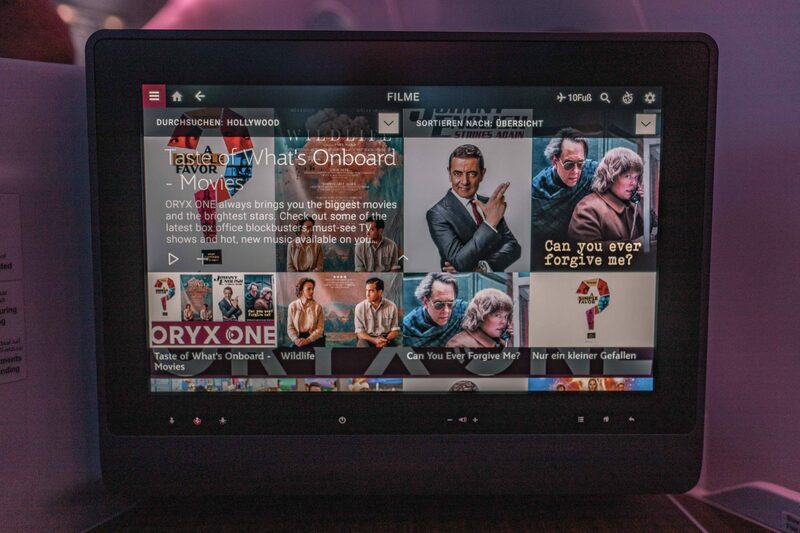 The on-board entertainment system offers you a variety of movies to choose from: from classics to brand new Hollywood blockbusters – I’m a 100% sure that you will find your favorite movie to watch. The screen itself has a tablet look-alike touch screen surface but you can use a remote to navigate as well. 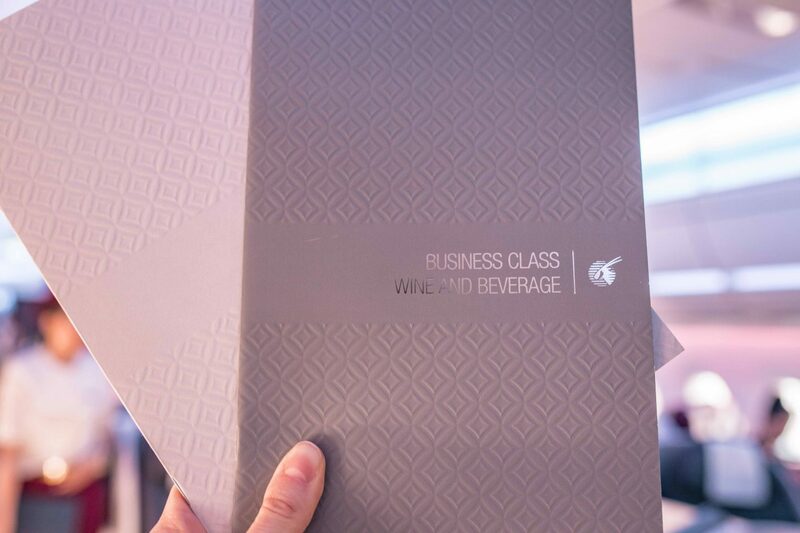 As mentioned before you will never leave a Qatar Airways Business Class flight hungry or thirsty as you can choose your food and drinks from à la carte menu. 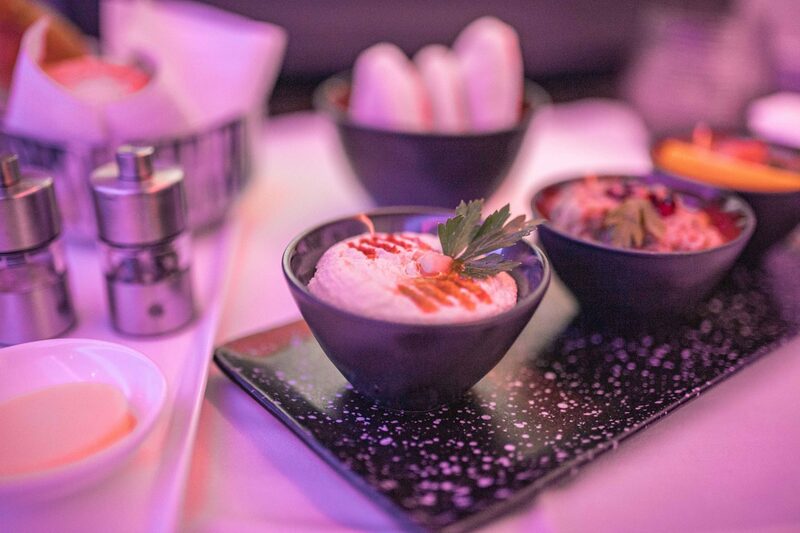 Depending if you are having a morning or evening flight, you may choose between various breakfast, lunch or dinner options (including starters, mains and dessert). 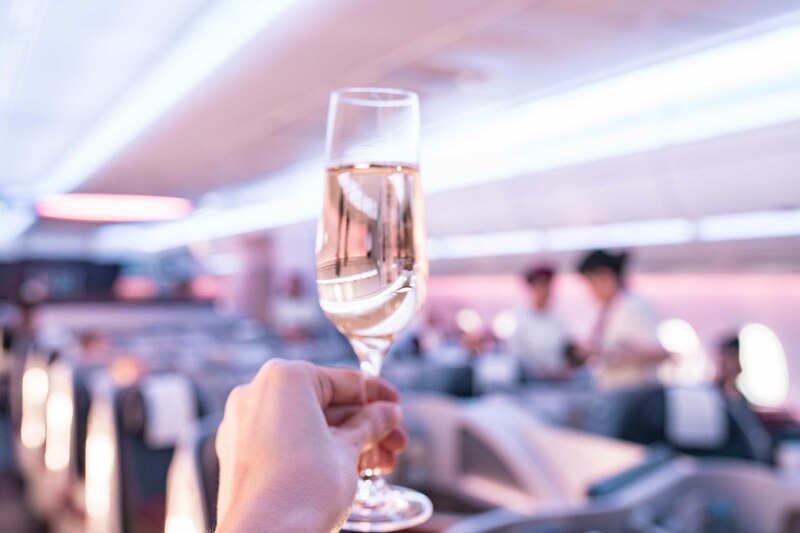 Qatar Airways offers an on-demand dining service so you can have your food whenever you like 🙂 Besides the different choices of food, you can choose among a huge selection of alcoholic and non-alcoholic drinks, including champagne and different wines. My personal highlight is the comfy seat of the Qatar Business Class. You have sooo much space and as mentioned above you can turn your seat into a fully horizontally bed where you will sleep like a baby. Besides turning your seat into a bed you have many options to adjust your seat. You can individually and automatically adjust your backrest, armrest and legrest, so you feel comfy and relaxed every moment of your flight. Furthermore you have enough space and privacy between you and your neighbor seat (in case you are seated in the middle of a row). All in all we can highly recommend you to spoil yourself and come on board of one of the many Qatar Airways Business Class flights! It will be an unforgettable experience and you will arrive at your destination fully relaxed and ready to explore the city or country of your choice. 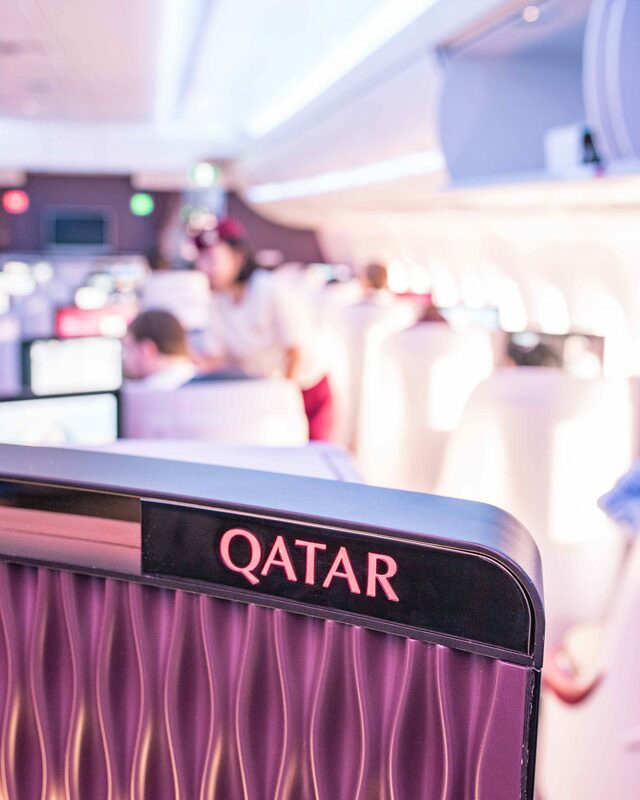 We can’t wait to fly with Qatar Airways again – thank you so much for having us on board! If you want to see some more footage about our Qatar Airways Business Class flights you can have a look at our Instagram story highlight. 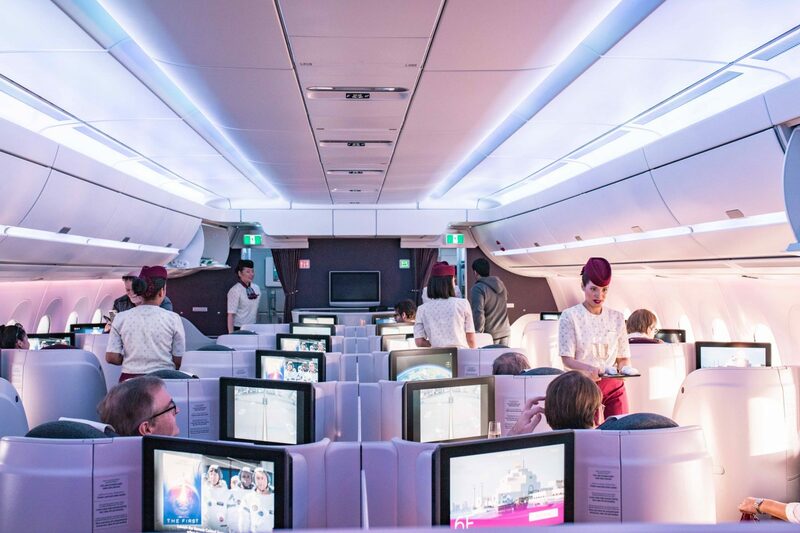 *Please note that we’ve been upgraded from Qatar Airways to enjoy their Business Class. This blog post and review is based on our personal opinion and experiences.